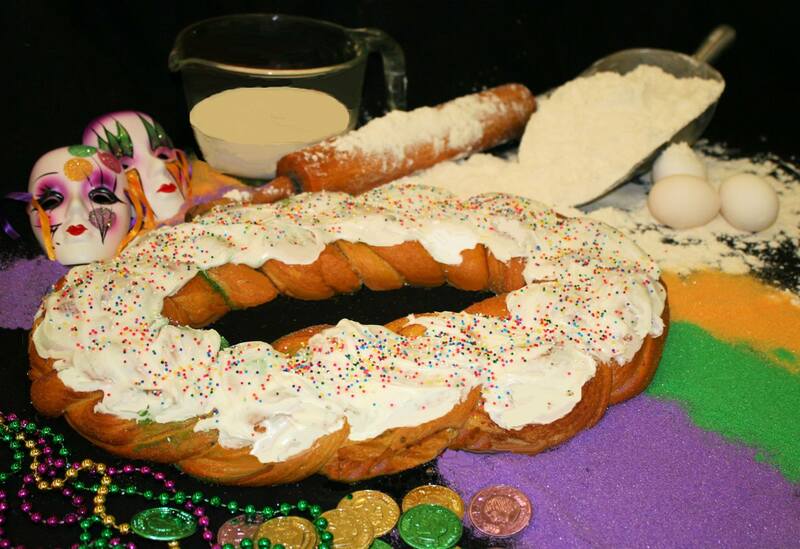 The King Cake has been a Mardi Gras staple for some 300 years at this point and is particularly beloved in New Orleans. 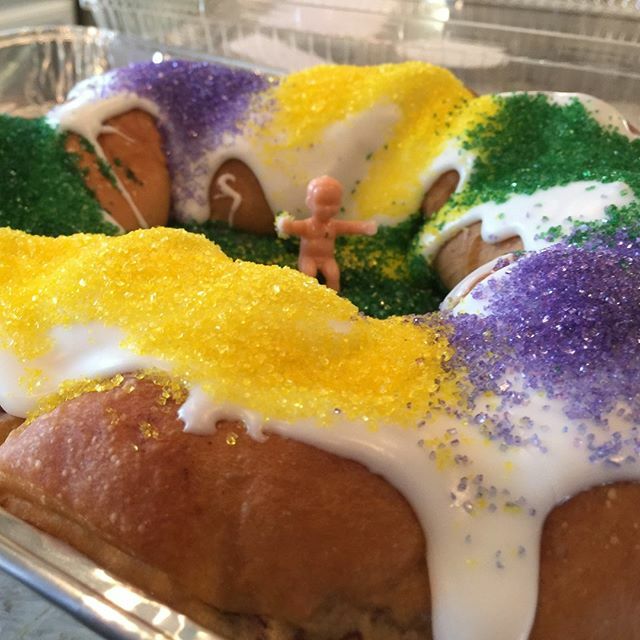 The cake is usually a hollow circle drizzled with a delectable glaze and topped with colored sugar, with a plastic baby Jesus hidden somewhere within, but crafty New Orleanians have come up with infinite variations on the basic theme. Here are some of the best bakeries, restaurants, and stores in the New Orleans area to get your cake this season. 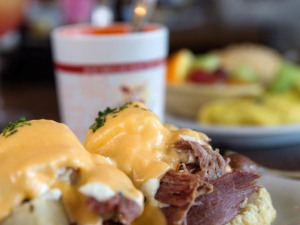 DTB (Down the Bayou) is the newest restaurant topping the list. Their coastal Cajun cuisine has made them a hotspot in New Orleans, and everything on their locally influenced menu is amazing. 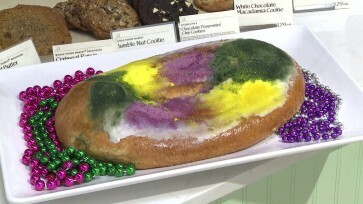 But save room for their unique interpretation of the king cake. 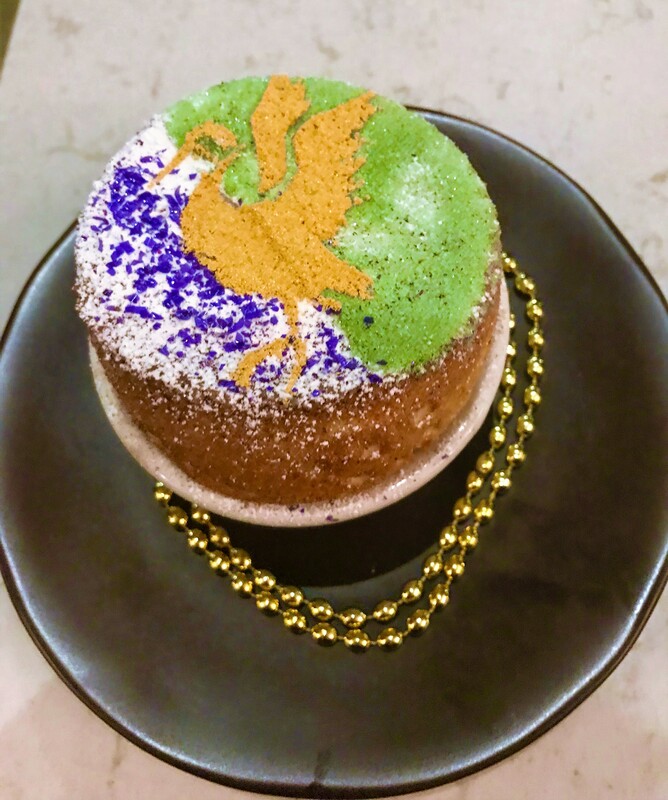 DTB has introduced the king cake soufflé. This cinnamon-flavored, Carnival-colored soufflé is light, creamy, and overall delicious. It’s the perfect size for just one or to share with one more (though you probably won’t want to). 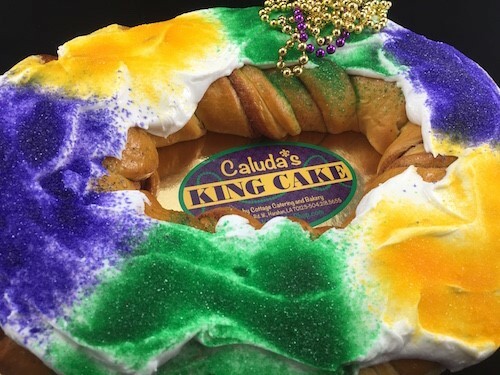 Caluda’s king cakes are soft, decadent, and delicious, and come in such fun flavors as strawberry cream cheese and praline cream cheese, as well as classic cinnamon. 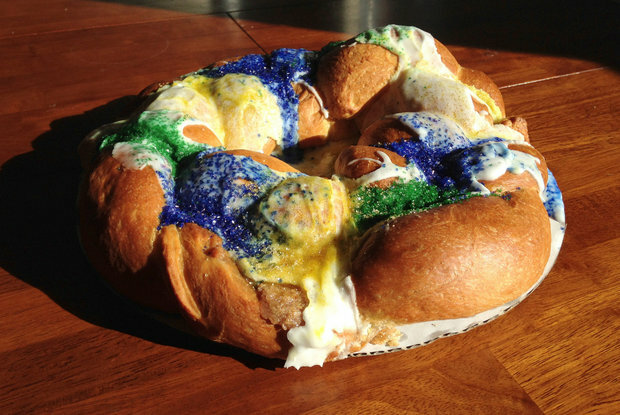 They even have a Saints king cake in case you want to celebrate our team’s big win yesterday. Check Caluda’s website for a different “Flavor of the Week” special, every week until Mardi Gras. Their chocolate chip cookie dough variety just might be one of the best things you’ve ever eaten. This bakery was one of the city’s first Vietnamese bakeshops. 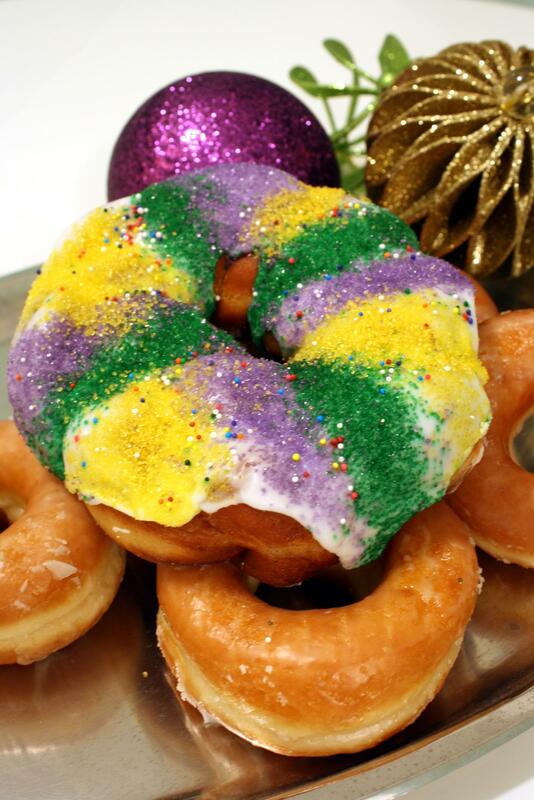 Their signature king cake dough has a flaky crust with a soft and light center which results in a mouthwatering dessert. 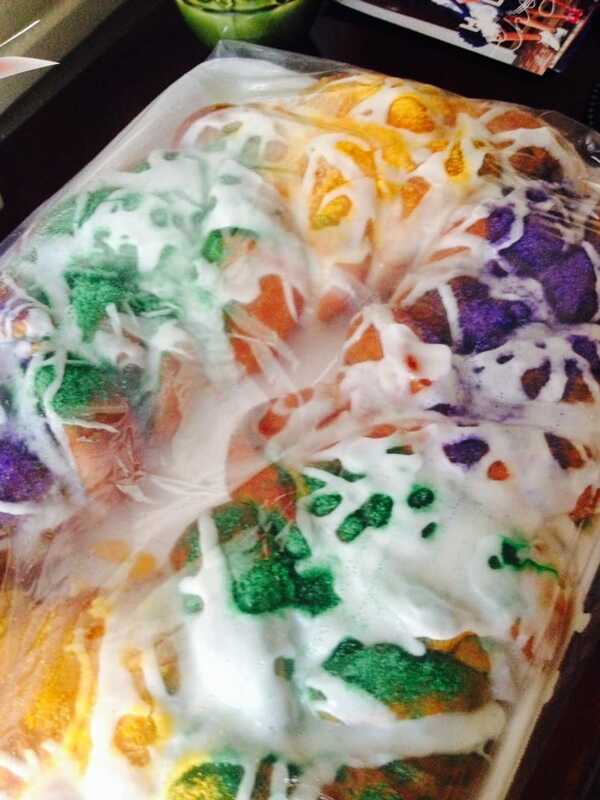 This local marketplace offers a variety of king cakes to satisfy your sweet tooth. 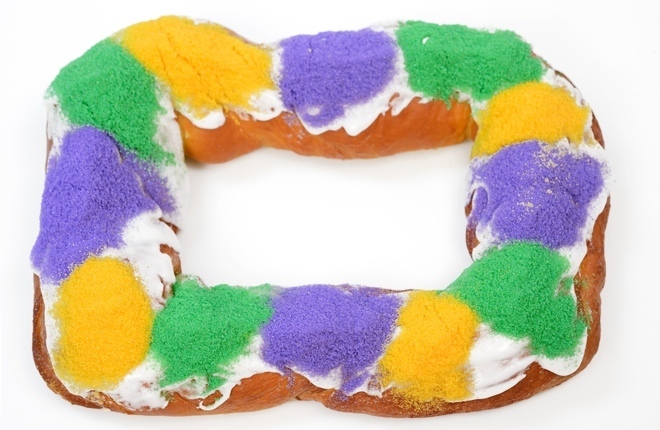 Their many options include strawberry cream cheese, plain cream cheese, Bavarian cream, praline, apple, or the traditional cinnamon king cake. 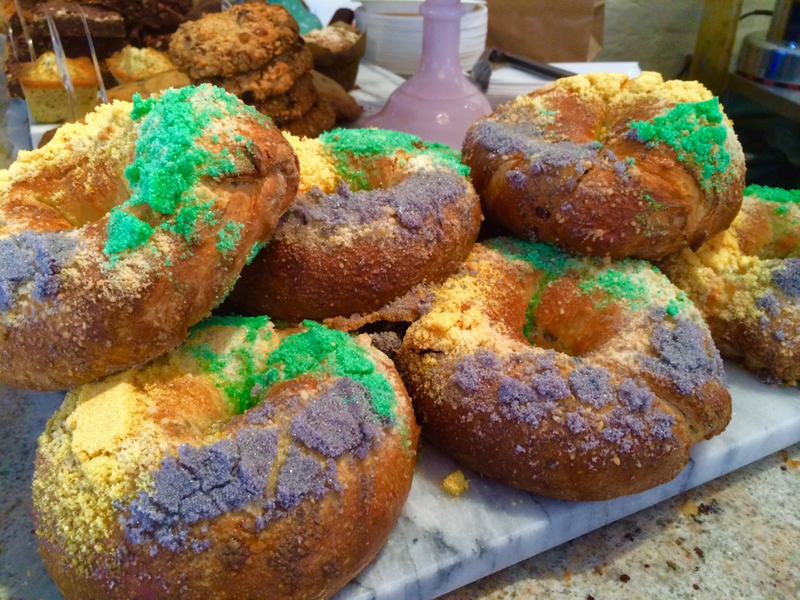 This coffee shop is known for their specialty king cake coffee, but you can also pick up their freshly baked king cakes from your local CC’s shop. 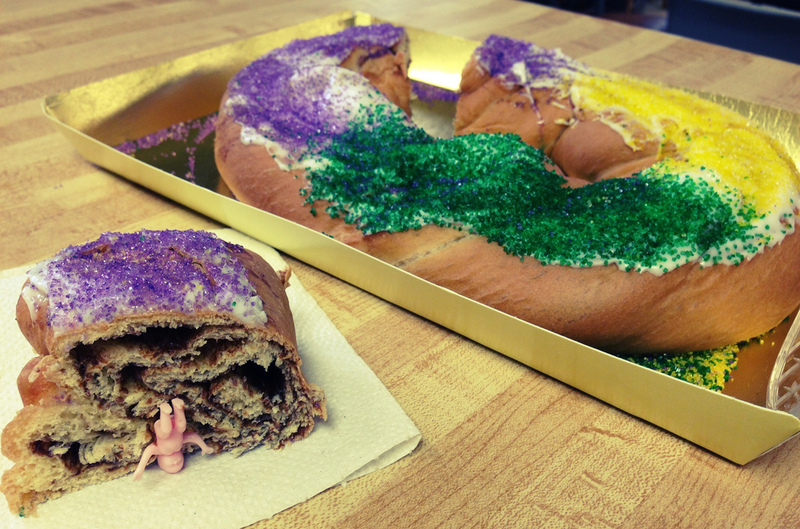 Their praline king cake adds a unique twist to the traditional dessert using a caramel icing topped with chopped pecans. Antoine’s Famous Cakes is located on the Westbank and is known for their queen cakes. This cake is truly fit for a queen and stands out from the king cake by adding all the fillings (cherry, pineapple, cream cheese, apple, and lemon) in a single, larger-sized cake. This small bakery provides some of the freshest cakes in the city, including both double- and single-filling options and a sugar-free version that’s still decadent and delicious. This place is a classic; their French Quarter and St. Charles locations both offer unique takes on the cake, including, of course, a praline variety, and they’ll ship them wherever you want. 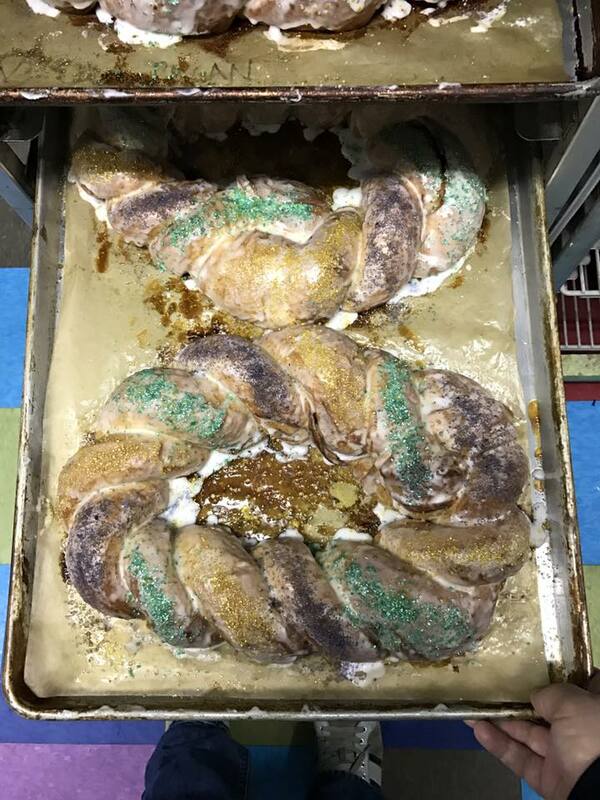 This beloved local grocery chain is selling king cake at all five of its locations, including a unique “Mudslide” version with a delicious, one-of-a-kind filling. This donut spot was founded by three NOPD officers, offers 40 to 50 varieties daily, and takes pride in their maple bacon king cake, which you’ll have to special order. 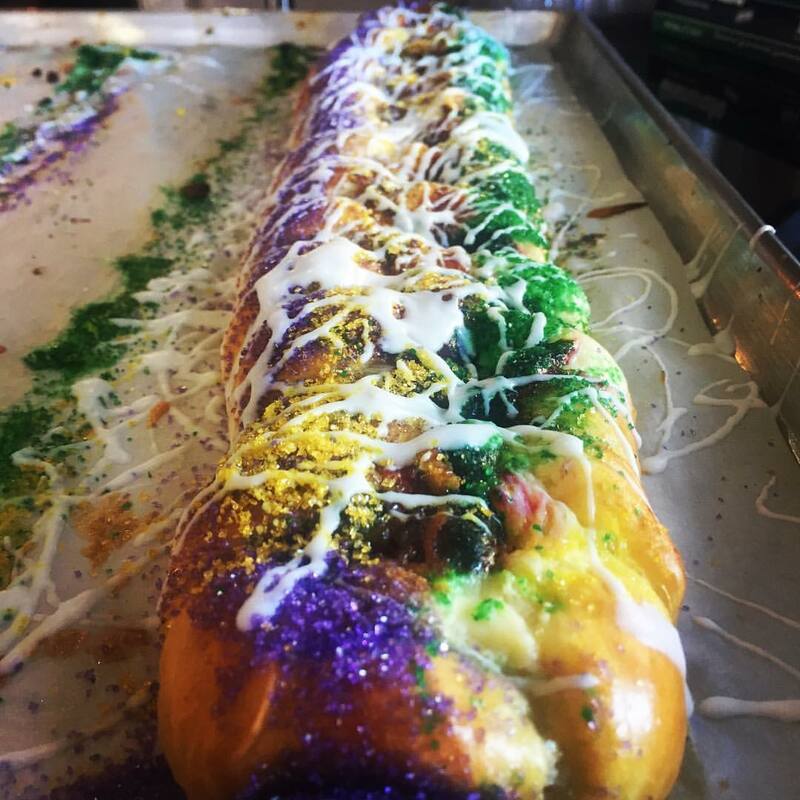 This place has unique donut holes and pastries, but they also do a killer king cake, stuffed with cream cheese, strawberry, or just about anything else you want. Cochon may be better known for their delicious meats, but they do sweets just as well. They offer a few sizes and flavors of cake, including cinnamon and strawberry, and substitute a plastic pig for the baby. 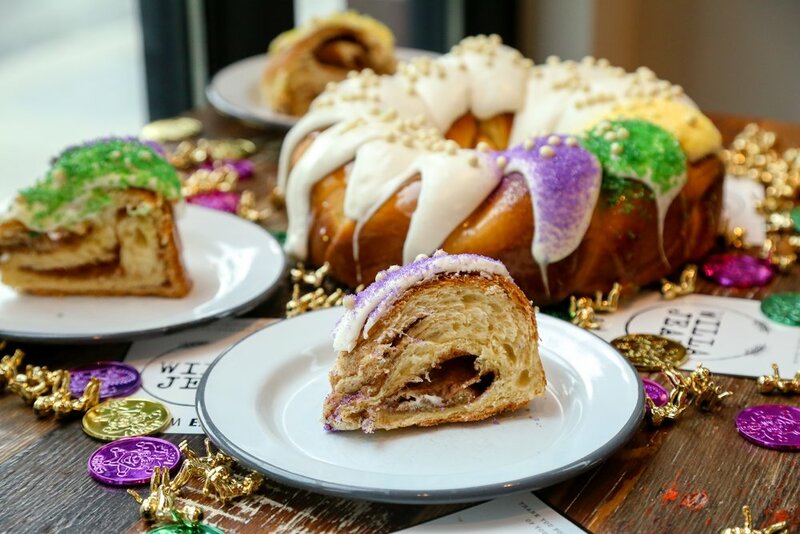 District is the city’s hippest and most bustling donut spot, and their king cake doesn’t disappoint, with hand-mixed cream cheese icing and a vibrant color scheme. 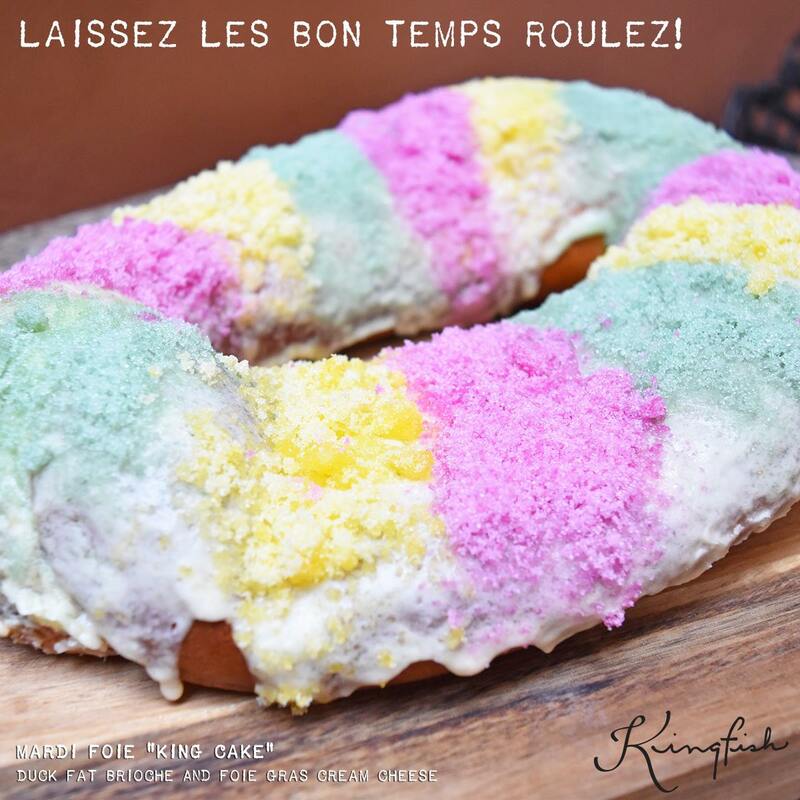 This world-famous bakery specializes in delectable king cakes, and they offer a number of variations, including bite-sized king cake balls and double-filled options including blueberry/cream cheese and strawberry/Bavarian cream. 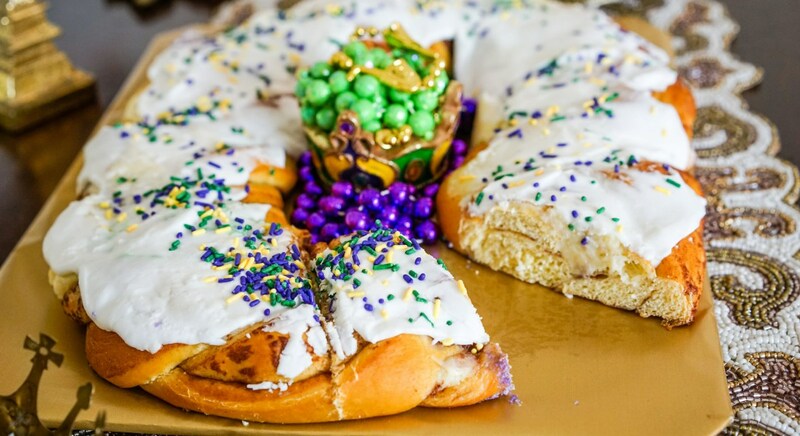 This traditionalist king cake outlet uses lightly drizzled icing and a Danish recipe for their dough, and they’ll ship you a package complete with a cake, beads, doubloons, and other Mardi Gras accouterments. 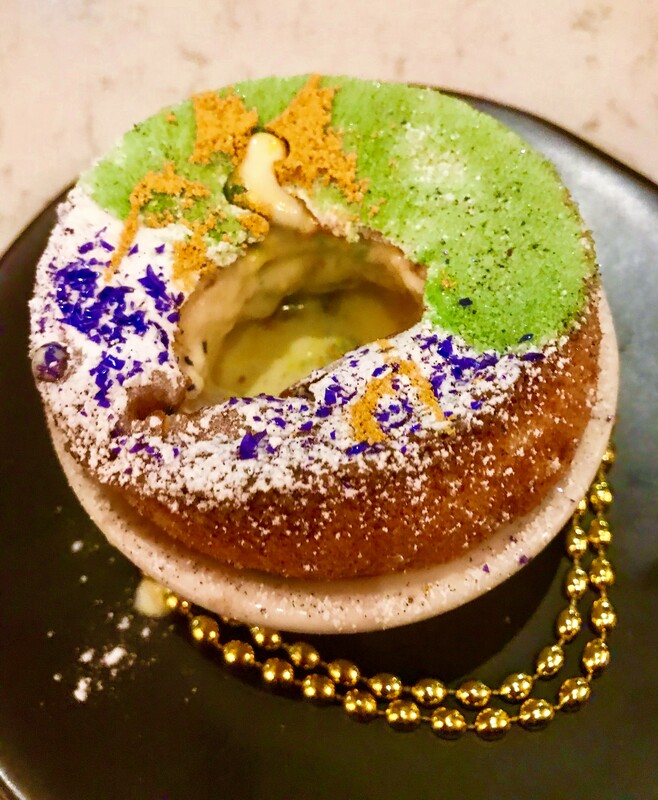 If a normal king cake is somehow not decadent enough for you, head to Kingfish and try their “Mardi Foie” cake, a hearty brioche topped with duck fat icing and, you guessed it, seared foie gras. This bakery, run by master pastry chef Ziggy Cichowski, presents European takes on pastries, and their flaky, delicately crafted king cake is no exception. 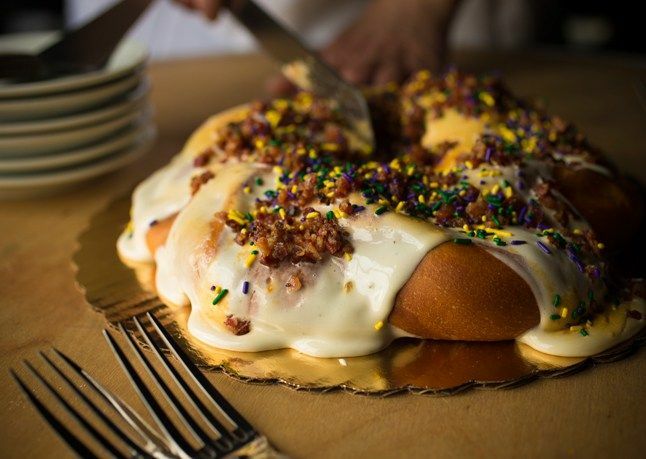 One of the Northshore’s destinations for king cakes, Nonna's has three locations in Mandeville, Covington, and Chalmette, and offers a classic take on the classic cake. Petite Amelie’s Chocolate Nutella Babka King Cake is baked fresh daily. 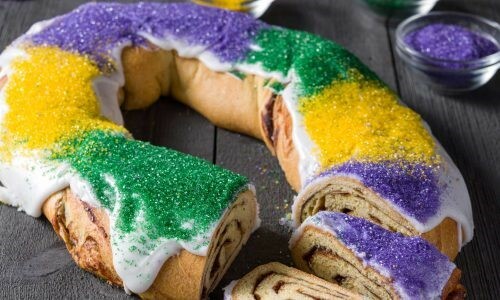 Layers of dark chocolate, Nutella, and cinnamon are deliciously layered into this Jewish-style bread in the shape of a king cake. Baby included. Whole cakes are $14, baby cakes are $7, and it’s $2 for a slice. 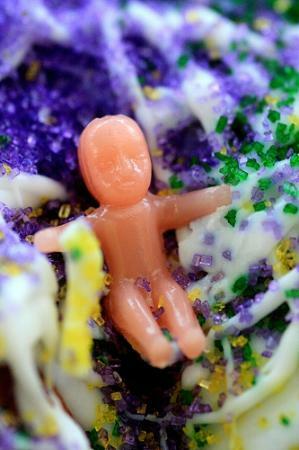 Manny Randazzo is a second-generation baker, and his family has been making king cakes since 1965. 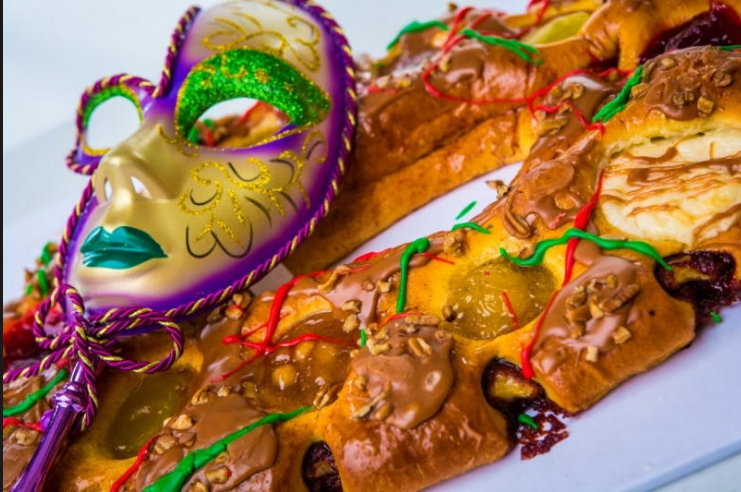 Their time-tested recipe has earned their praline pecan cake awards as the “King of the King Cakes,” and this family business is open to shipping cakes on special occasions. 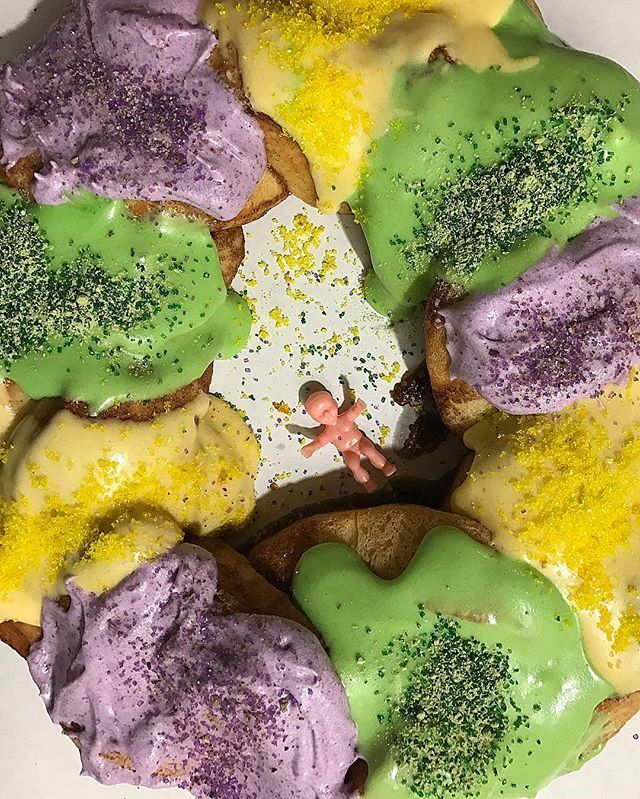 The go-to spot for king cakes in the Bywater, this hip spot offers various stuffings, traditional cakes, and, of course, a vegan option. They sell by the slice, but if you’re looking for a whole cake, you’d better call in advance. A great lunch spot in Uptown, Tartine also houses a killer bakery. 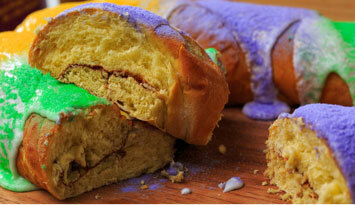 Their king cake is a perfectly executed brioche with a delicious filling of brown sugar, cinnamon, and cream cheese. 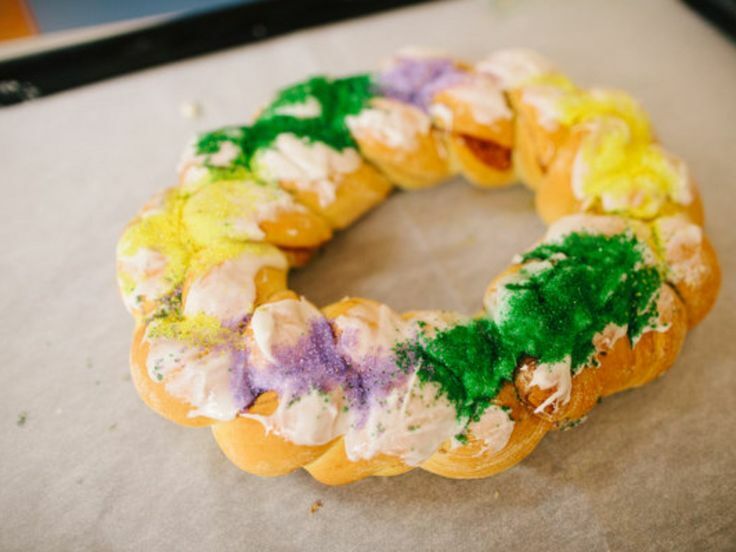 Whole Foods might not be the first place that comes to mind for authentic king cake, but their bakery is an underrated source of confections; try the version filled with Chantilly cream. 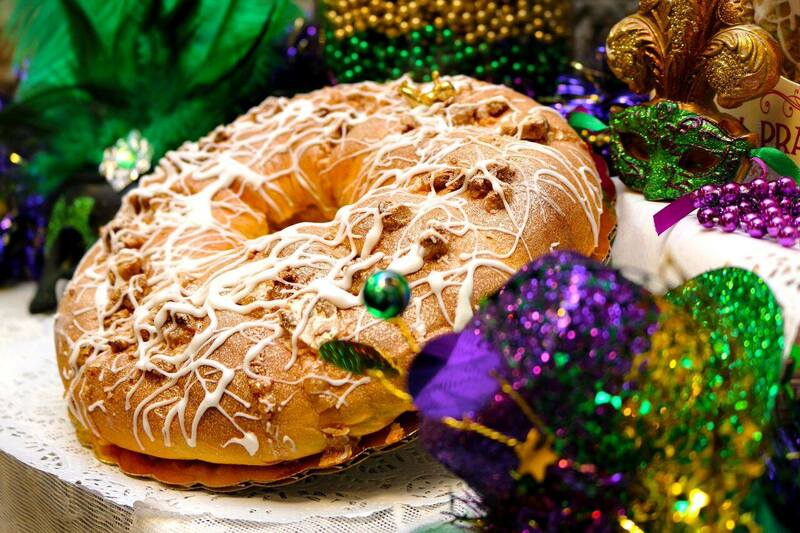 Willa Jean doesn’t deliver, but it’s worth trekking over to O’Keefe to grab one of their caramel crunch king cakes. Order your cake two days in advance, as they make them fresh to order You can also get just a slice for $5. Editor's Note: Most photos have been pulled from the business's website and/or social media feed.